Welcome. As a wine enthusiast, I spend a considerable amount of time touring the best wine-producing regions of California, tasting wine, buying wine, and of course drinking it. I am not on an unlimited budget so I buy what wines that I can afford, usually looking for the best wine values. I do not feel that you need to be a wine snob to enjoy wine, nor should you need to buy or enjoy wines based on the subjective point systems of a few reviewers. I have visited several hundred California wineries, and many on a regular basis, so the information should be somewhat current. Along with my experiences, I have recommended what I think are the best wineries each area has to offer (otherwise I keep my mouth shut). During a recent trip to Europe, I had the opportunity to visit wineries in Germany's Rhine River area and France's Alsace region. 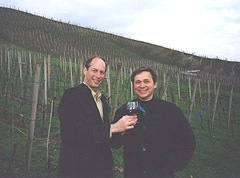 Here I am sharing wine with winemaker Martin Renner (right) in a vineyard of the Julius Renner Winery in Germany's Black Forest town of Oberkirch. This website is published by wine enthusiasts for wine enthusiasts. Bridlewood Winery's mission-style, wood-beamed tasting room opened in April, 1999 on the site of a former horse ranch. In fact, all of the original buildings on the 105 acre spread are still in use as the tasting room and production facilities. The wines are among the best I've tasted from the Santa Barbara area. The selection if gifts is among the best I've seen at any winery, and they also offer a selection of deli items. There are several quiet areas in which to picnic and enjoy the views. Rombauer's 2003 Napa Valley Zinfandel is the wine that can convert even the most die-hard Cabernet to the world of Zinfandels. The wine is full-bodied-- chewy and inky-- with flavors of black fruit and chocolate and hints of mocha. The finish is long and clean. I can honestly say that this is one of the best Zinfandels I can remember. With a retail price of about $28, this wine is a bargain. This is a wine that goes well with grilled meats and can stand up on its own. Do you have a favorite California wine that you would like to share with other wine enthusiasts? We will soon be publishing guest wine reviews. "A great website for down to earth, unbiased opinions of wineries to visit, wines to drink, and wine trivia." I just wanted to drop you a line and say thanks for your help. I went on myfirst wine tasteing adventure, You saved me from some potentiallyembarrassing situations. Your site has helped me understand wine and how toserve different wines. So thank you for taking the time to build your siteto help newbies like myself.